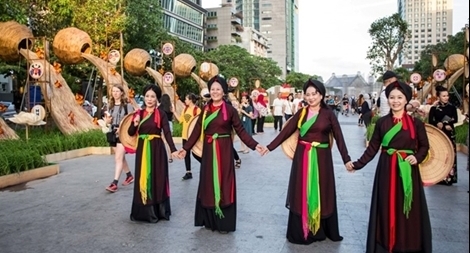 A Vietnamese folk culture festival took place from April 13-15 in Ho Chi Minh City to serve local people and visitors in celebration of the country’s annual Hung Kings' Festival. PSNews-State President Tran Dai Quang visited the Ho Chi Minh City Municipal Police on January 23 on the eve of the lunar New Year Festival (Tet). Vietnam received an estimated US$18.1 billion in new FDI pledges from January to November this year. President Tran Dai Quang reiterated Vietnam’s commitment to create optimal conditions for foreign enterprises to do business in the country while receiving Sultan Ahmed Bin Sulayem – Group Chairman and CEO of the UAE’s DP World, on December 13 in Hanoi. PSNews-Senior Colonel Tran Van Luan, Chief of the Tay Ninh Provincial Criminal Police Office, who had participated in cracking down on many human trafficking rings, said that the situation of illegally transporting Vietnamese people to other countries is very complex. The city is seeking parliamentary approval to implement the first phase of the project with possible loans from Europe. According to AusTrade in Vietnam, “Australian oranges-Now in season” promotion campaign from September 23 to Octorber 2 at supermarkets in Ho Chi Minh City and Hanoi such as Aeon Mall, Annam Gourmet Market, Co.opmart has kick-started the availability of Australian oranges in the Vietnam. On September 22nd, The Ministry of Education and Training (MOET) has released the official opinion regarding the two issues in which public are concerning: The pilot programs to teach Russian and Chinese in 10-year system as the first foreign language and the proposal to have a separate National High School Graduation Examination in Ho Chi Minh city (HCMC). The High-Level People’s Court in Ho Chi Minh City on March 18 upheld imprisonment penalties given to five defendants for “attempting to overthrow the people’s administration”.